Here’s wishing you and yours a happy and drama-free Thanksgiving. 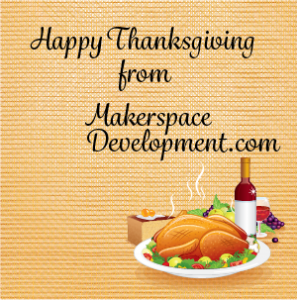 We at MakerspaceDevelopment.com are so thankful for all of the support we’ve gotten from the makerspace development community. Without your continued engagement, it will be very difficult to show that the new American dream includes more than just owing your own home. It also includes a pathway into the creative class and control of ones own life.